Who’s mean, green and back for Guardians of the Galaxy Vol. 2? This exclusive Zoe Saldana Interview spills how Gamora is balancing work, motherhood and life. Post sponsored by Disney. All opinions are my own. Post-pregnancy goals. I’m sitting with Zoe Saldana and all I can do is stare at how tiny she is. Didn’t this lady just give birth to twins? 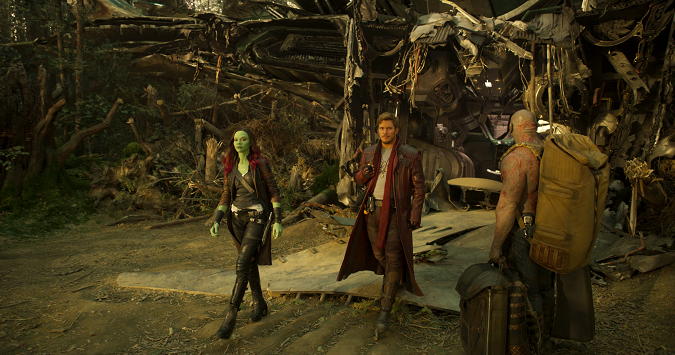 And besides that she had this amazing “mom glow” going on (you know, besides the fact that her skin was bright Gamora green), Zoe just emulates Gamora is every sense of the character; hard-core, strong-minded woman that doesn’t fear hanging with the boys in Guardians of the Galaxy Vol. 2. How is Zoe Saldana balancing her role as the lean, green, fighting machine Gamora with motherhood? Check out our exclusive Zoe Saldana Interview. Getting back into the role of Gamora? Just like getting on a horse. It feels good. It feels really, really good. It’s like coming back to a family of people that you already broke the ice. You feel super safe in being yourself and trying new things. You’re working with a director that is super supportive. It’s still a dude’s movie where he’s inviting women to come and kick dudes’ a**es. So I signed up. And it’s great. I’m doing a lot more stunts, too, which I’m loving. Not that kind of chemistry, silly. Obviously Zoe Saldana and Chris Pratt have a special bond on and off the screen. When not filming, you can find these two Guardians stars exchanging parenting stories and advice. We’re parents of wonderful little boys, and we’re constantly bouncing back ideas. He shares with me how Anna also is handling being part of a family that’s a traveling troop. She has to also stay and work and everything. I also share that experience. My husband and I have to make these ultimate sacrifices because one of us has to travel with work and the other one is like, “Okay I’m working remotely with you.” At the end of the day it’s too [much] not be apart. So there’s a constant conversation. We also compare what kind of fitness things we’re doing lately, what we ate. And sometimes we just talk about what’s a good bottle of wine that we’d like to have, so we never run out of things to talk about. Think it was easy for Zoe Saldana to get back into shape post-twins? Not so much. But don’t lose hope, mamas. She offers some amazing motivation for you! I gained 65 pounds. I did not want to hate myself, and I did not want to start fantasizing of what I used to be. I wanted to work with what I have. I’m not comparing myself to everybody, but if my experience can be inspirational for you guys…I’m a killer. I don’t just approach [life] like “Oh, I’m going to start Monday because Sunday we’re having the barbecue.” No way, because to me it’s scarier to look at myself while I’m brushing my teeth and have 10 things to say about myself that I hate. I don’t want to live like that. We’re gifts. We’re unique. We’re special. We’ve got to work. We work for everybody else every single day. You work for yourself. Be self-focused. It helps a lot when you have a partner who is super supportive and understanding of like the ups and downs and compassionate, empathetic about the fact that you just went through a life changing transformation. So, find fountains of support. It’s very important. Speaking of her husband, Zoe is adamant that having twins and being a super hero doesn’t mean that you put your marriage on the back burner. She has some advice for all of us busy moms out there. Talk. Talk about everything. No assumptions. No reserved feelings. Just last night, Marco (her husband) goes “Okay, I understand we’re super busy, [but] let’s practice still connecting, conversations. I don’t care what we’re talking about. If you’re in the bathroom while I’m in the shower, let’s just share five things. It could be five anything.” And I love that. You just have to constantly keep it open. And not just because you’re so tired. You can’t get lazy with the most important work in your life, which is your home, your life, you know? So, that’s one tip that I would love to share. We’re doing it, guys. 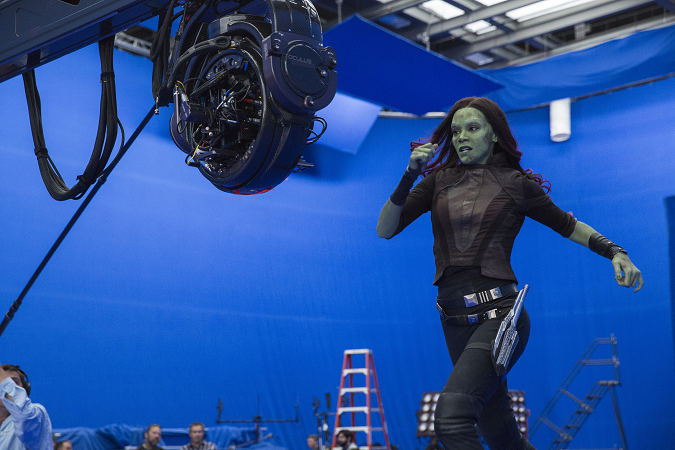 Zoe Saldana understands that Gamora is so much more than a Marvel super hero. She’s a hero to all of those little girls that are watching too. I like sci-fi, and I like spaces that are under-served. And I think that for females, we need much more diverse examples. I think that as women, we need to be a little more physical. It’s better for our health. It helps our sanity, too. I was a little girl starving to have more female heroes. And I held on to the very few that were out there, and then I decided to become one. Because that’s what we do for our little girls, you know? Guardians of the Galaxy Vol. 2 is in theaters May 5, 2017. 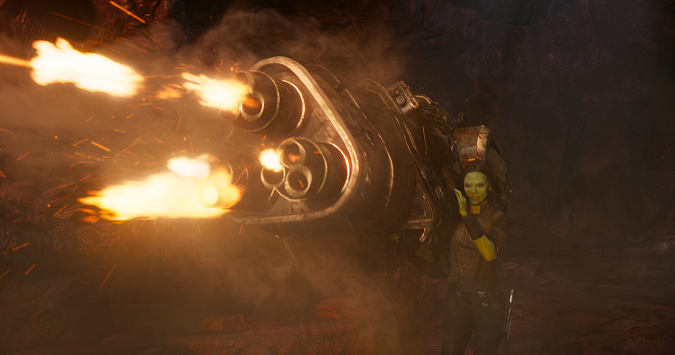 What do you love about Gamora? More like what do I love about Zoe!! She’s so honest!! Love her!! I love that she and her hubby talk about everything!! So important!! I’ve been seeing so much about this movie recently that I thought it must be coming out right now, lol. I was surprised because I figured they would make this a ‘Summer blockbuster”—& they are. I just noticed, in your post, that it comes out in May. well, it’ll be a good one, I’m sure.